Brand New High quality chrome vegetable cart This robust storage caddy is ideal for any room in the house. Made from sturdy chrome tube and wire its three storage shelf baskets can hold all manner of goods. 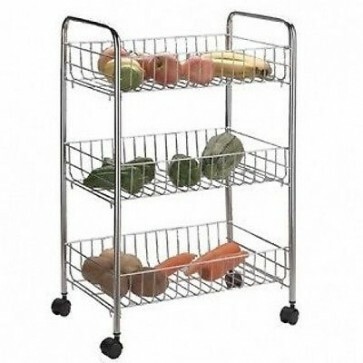 Perfect for the kitchen as a vegetable cart and in the bathroom to keep all your toiletries and towels tidy.